Another way to get great fashions, if you like black, is Battlegrounds. I’ve been doing the Corsair Stronghold over and over to get costumes. To get a costume, you need 7000 points, which you can get in about 3 long days of work in the Corsair Stronghold. Starting at level 30 you can queue for the battlegrounds. I’ve tried the Kumasylam, and you may like that one. The Corsair Stronghold is sort of Storm the Castle kind of event where each team of 20 toons alternatively tries to storm and defend the castle. Each run takes 10-25 minutes and gives you from 150-500 points depending on Lose or Win. 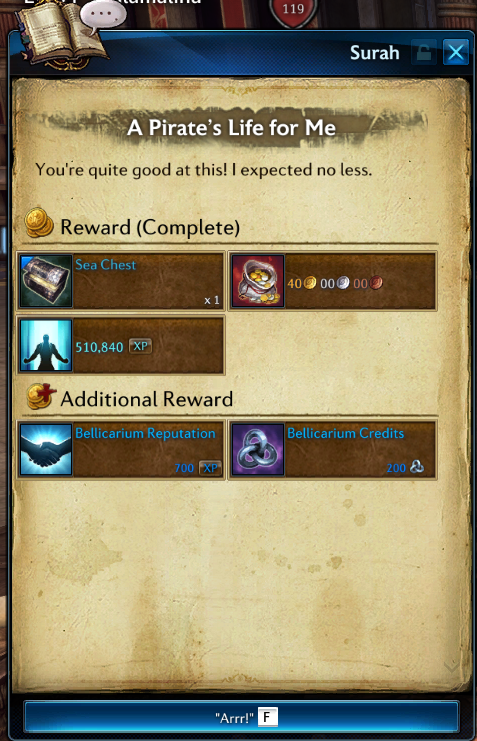 And once a day you can do the Pirate Daily quest, which gives good loot and 200 points. So as it turns out it doesn’t take that long to get your 7000 points, and along the way you’ll get a couple levels, and maybe a couple of hundred Gold in loot mailed to you for your wins. But don’t take it very seriously, because you are going to die enough to get the Black Death achievement for dying 100 times and the “Death Eater” title. When you enter, you’ll be buffed to level 60 and given Black Label, or the Gold version, a great armor, accessories and a weapon. Don’t necessarily try to figure out what you are doing, just follow along and help out however you can. Since you are probably a low level toon. Stay out of PVP as much as you can since you are toast if someone targets you. But don’t worry about that. You are just here for the Bellicarium rep so you can get the black label costume. Death has no penalty except time to get back in the fight – you won’t lose crystals when you die. You may want to grab a Siege Engine if you can since you’ll do a lot more damage with one of those. Target the top of ladders to help those climbing, or preventing attackers from climbing depending on the side of the fight you are on. Anyway, you’ll get it. Just jump into the fight and don’t take it too seriously, Remember you are just here for the points to get your fashions. Sometimes you’ll be with a good team and many times with a bad team. It doesn’t matter. When you have your 7000 points, or before, you can visit the Battleground NPC in Velika Central Command to preview or purchase your armor. Use Left Ctrl, Right Click the item to preview it. Here are the looks for some of the armors. 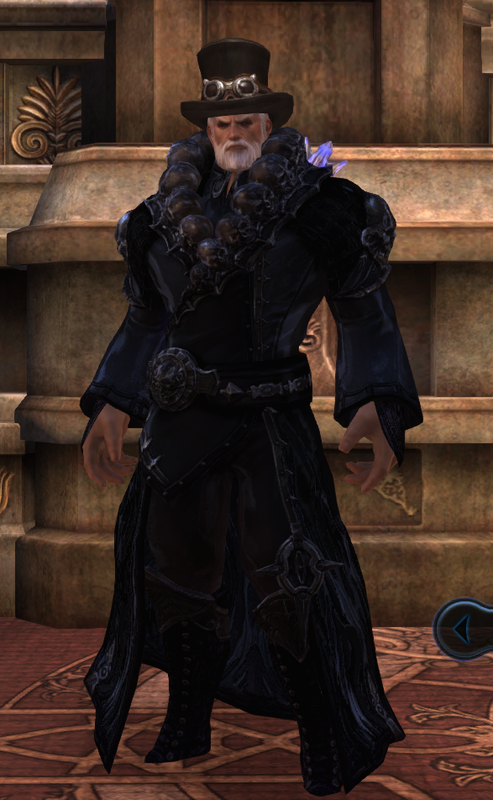 The Black Label armors are black versions of other armors most of which appear in the Fashion Coupon sets. Notice the last two metal armor examples. For the Castanic female armor, the Black Label plate is black Unusual Plate. For the Human Male, the Black Label plate armor is black Dreadwraith Mail armor.